Pápai Páriz Ferenc, Album amicorum p. 19. * This quotation is a paraphrase of Seneca, Epistulae morales ad Lucilium 27.9: “Nunquam nimis dicitur, quod nunquam satis dicitur”. May this little trifle, as my wishes of a fortunate travel, accompany the eminent, noble and erudite young Ferenc P. Pápai, when setting out to foreign countries for increasing his experiences in the noble science of medicine. In Vienna of Austria, on September 22, 1711. The Balku family of Hadház, noblemen of Bihar county, had a bent right arm with banner and club in their blazon. A member of the family, Pál Balku lived in Kővár (Chioar), and was a leader of the anti-Austrian rebels in exile. In 1678 he was Captain of Kővár, and in 1690-93 Lieutenant Captain of Kolozsvár (Cluj). 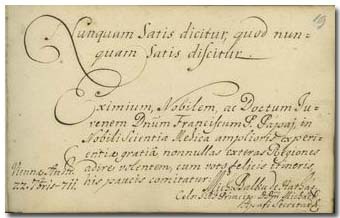 Another member, György Balku was a civil servant at the Chancellery of Transylvania in Vienna in 1695. Mihály Balku was the secretary of Prince Mihály Apafi II. in Vienna, and after his death a civil servant of the Governorship of Transylvania established in the same city. He died around 1731. Mihály Balku wrote in the Album on September 22, 1711. According to his note, at this time he was the personal secretary of Prince Mihály Apafi II, who lived in Vienna since the beginning of the Austrian dominancy over Transylvania. Prince Apafi himself wrote in the Album on the following day (p. 35).